We’ve been eating healthier this month, and have been experimenting with new meals and recipes. That said, this week was very chicken-heavy. Not by design, but mainly by circumstance. 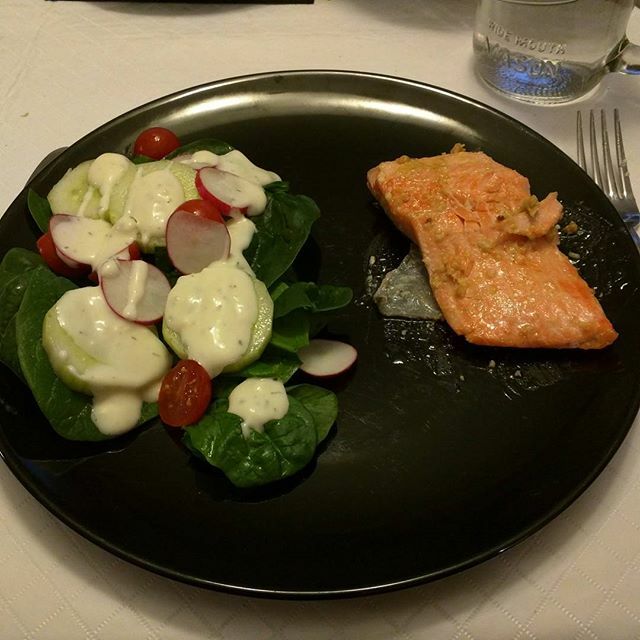 Sunday: Trout with a ginger-mustard sauce and a spinach salad. Apparently I had a huge liking for trout as a kid…then it stopped being a part of the family diet and I (somehow) became deeply suspicious of most seafood. I think it’s possibly because it wasn’t a part of the menu at the time I was forming the bulk of my palate. Also, the smell of salmon baking is a migraine trigger for me, and it’s given me what could be considered a fear of fish. We’re overcoming it with trying alternate cooking methods and tasty ways to zest up the dish. Monday: No picture here…I made a beer can chicken and served it with creamed cauliflower (aka “fauxtatoes”), or in our household, “stuff”. There was a garden salad to go with it, if memory serves. Tuesday: I baked a quiche and served it with (what else), salad. 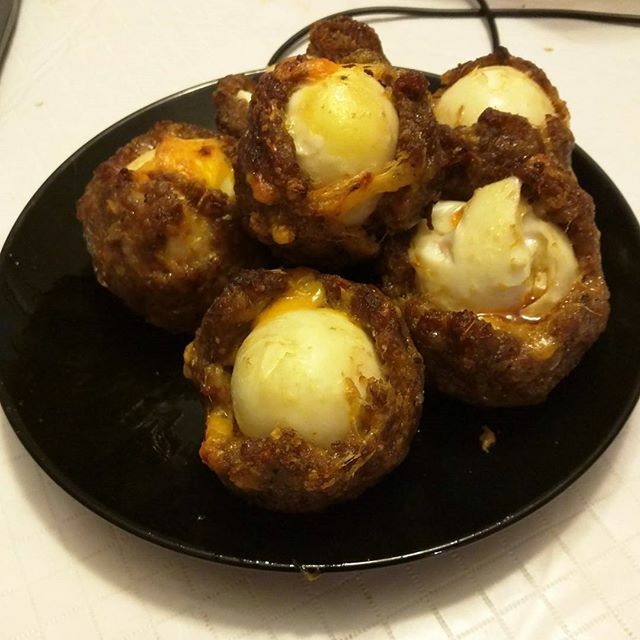 Robin made up some Scotch Eggs, as he figured they would be portable for quick meals at work. It worked out well for him, because he’s taken both Scotch Eggs (or “Dragon Eggs” as I’ve started calling them) and leftover quiche in to work with him for lunches. 1001 Low-Carb Recipes by Dana Carpender. 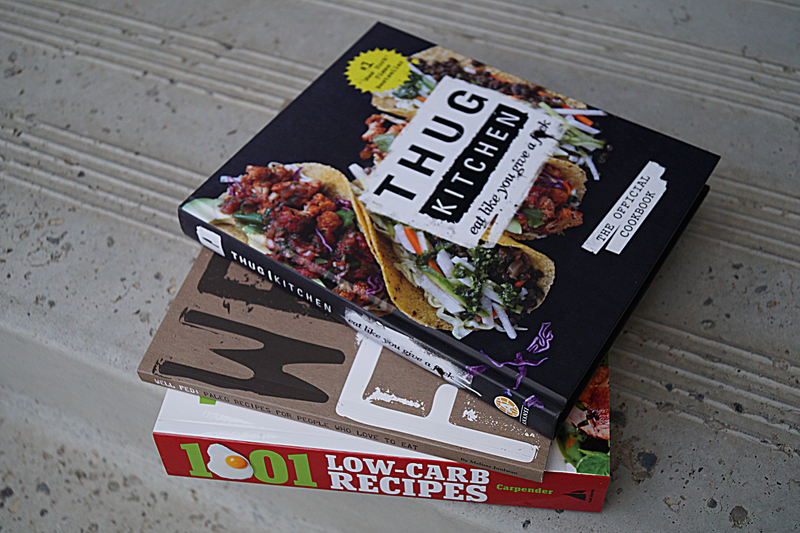 We have her 15-minute Low Carb Recipes book, and it’s become a valuable resource, so the 1001 Recipes can only augment that. Well Fed by Melissa Joulwan. I’ve been reading Melissa’s blog off & on for a few years now & am not adverse to borrowing bits & pieces from the Paleo Diet where I can. Looking forward to picking up the next book in the series! Thug Kitchen. This was one of the Husbeast’s picks, and will likely be used when we want a heavier-carb/calorie meal. Obviously we aren’t anywhere near vegetarian in our way of eating, but we do have friends who are. It’s nice to be able to offer them something tasty when we invite them for dinner. 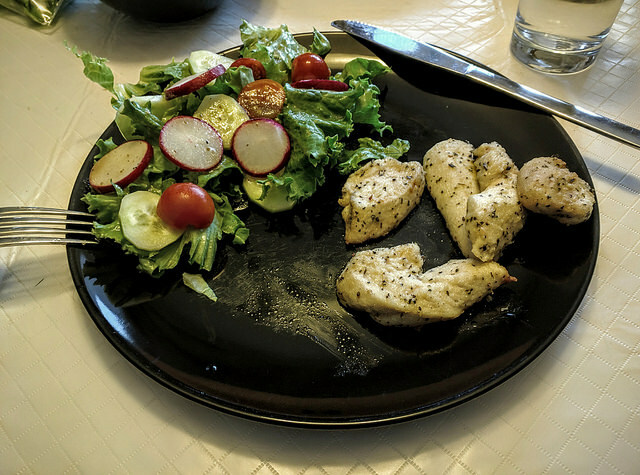 Wednesay: We hadn’t taken time to go to the store for anything for dinner, so we made do with what was in the freezer….one boneless, skinless chicken breast, and one with both the bones and skin. I made the latter look more like the former, chopped ’em up into strips, and “breaded” them with a mixture of parmesan cheese, salt, pepper, Grains of Paradise and Basil. Quick & dirty Chicken Fingers. Served (yet again) with salad. 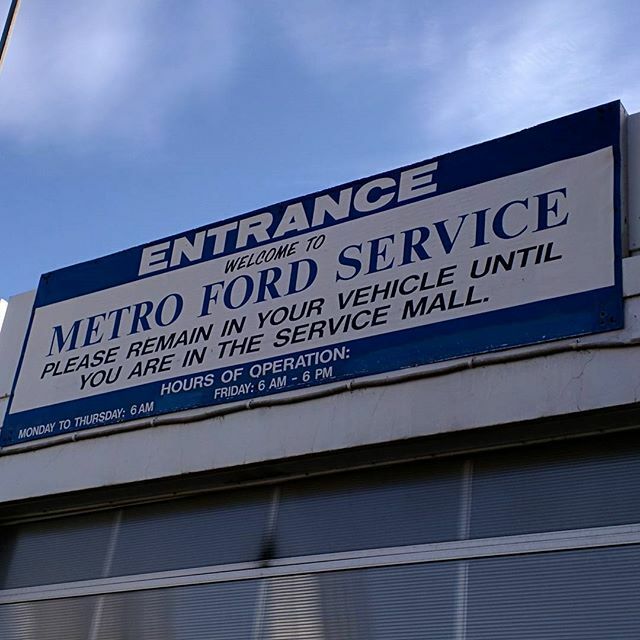 Thursday: The car had to go in for regular maintenance and a software update. I can’t believe I live in an age where my Ford has to have periodic software updates! At any rate, I didn’t get to the grocery store (again) due to taking the dealership’s shuttle, and we needed a dinner that would give us leftovers for work lunches. Enter the stir-fry. 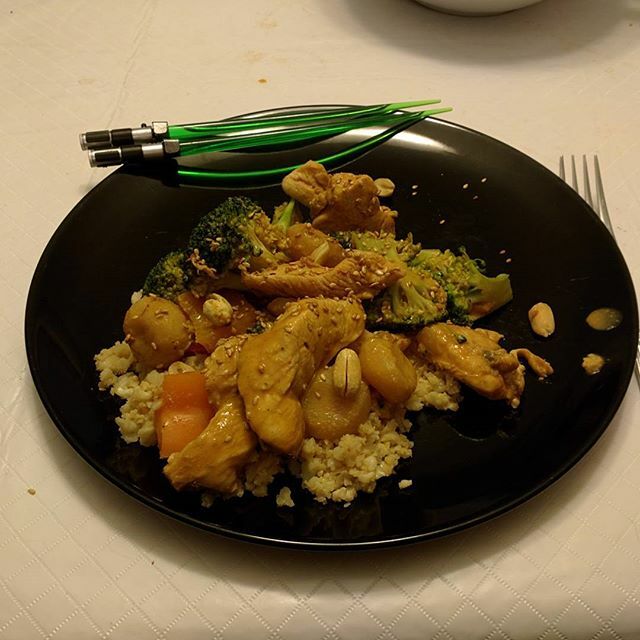 After a quick trip to the Co-Op (once we had the car back), the Husbeast stir-fried some veggies, some chicken (told you so) and some prawns and we served them in a homemade Thai peanut sauce over cauliflower rice. Very tasty! We have a mostly-finished menu for next week ready to go. Our goal is to hit the Co-Op and/or Safeway and snag a full week’s worth of groceries at once. Ideally we’d like to not have to go to the store at all during the week. Challenge accepted!